Sacred art in Christ Cathedral features new work by prominent artists inspired by the life of Jesus Christ, who want to depict Him using modern iconography. 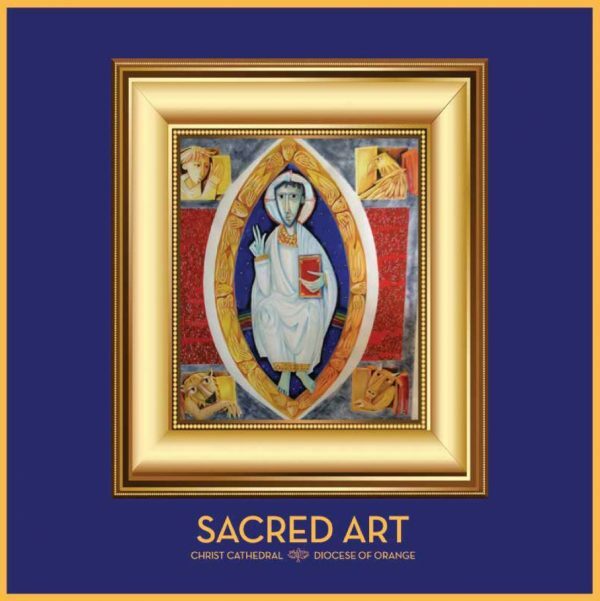 The sacred art, by six internationally recognized artists, is designed to welcome worshipers into the presence of the Lord, introduce the communion of saints and the glory of Our Lady, the Blessed Mother, as well as to accompany us on our journey of faith inspired by the Holy Spirit. “The art in Christ Cathedral will pass judgment as good art and also be both evocative and provocative, evoking commentary – and that’s when art is successful,” says Brother William Woeger, a member of the Christ Cathedral Sacred Art Commission. Bro. Woeger is consulting on the art commissions and is one of the artists, responsible for creating the Crux Gemmata (crucifix over the altar), altar candles, Paschal candle, sanctuary lamps, reliquary (container for relics at the altar), and dedication candles. Pablo Eduardo, a Bolivian-born sculptor known for marrying his Spanish-American heritage with his training and intimate knowledge of his craft, is designing four Manifestations of the Divinity of Christ, 14 Stations of the Cross, and the Festal Doors. Eduardo’s sculptures, rendered in bronze, are recognized for capturing a snapshot of artistic metamorphosis while celebrating rhythm, emotion, texture and tension. He is known for developing close relationships with his clients. “I met with Bishop Vann and Father Christopher Smith (episcopal vicar to Christ Cathedral) and I think of them the whole time; I’m trying to capture their spirit, to speak in a way they understand. Other artists commissioned to create sacred art for Christ Cathedral include: the Ferdinand Stuflesser Studio in Ortisei, Italy, which made the corpus for the Crux Gemmata; the Valerio Lendarduzzi Studio in Fontanafredda, Italy, which is creating the Our Lady of Guadalupe mosaic, and the coats of arms mosaics in the narthex (an architectural element consisting of the entrance or lobby area, located at the west end of the nave, opposite the church’s main altar); Mia Tavontatti, an award-winning artist and painter, who is creating the baptistery mosaic; and ceramicist Brother Martin Erspamer, a monk of Saint Meinrad Archabbey, who is making the tapestry of the Pantocrator, or Christ seated in glory as the Lord of Creation. Bro. Woeger says some of the cathedral’s sacred art is inspired by the Egino Weinert tabernacle completed in West Germany in the 1970s, which was acquired from the Weinert family in 2015. Tabernacles are used to hold the Eucharist and provide a place where congregants often pray. The Sacred Art Commission includes Bishop Vann, Mission Basilica Rector Emeritus Monsignor Art Holquin, consultant to the Architecture and Renovation Committee; Father Smith; Bro. Woeger, a member of the Brothers De La Salle based in Omaha, Nebraska; Lesa Truxaw, director of the Office for Worship for the Diocese of Orange; Monsignor Mike Heher, pastor, St. Anne Catholic Church in Seal Beach; and Tony Jennison, vice president for philanthropy for the Orange Catholic Foundation. More than 30 sacred art and Cathedral campus items have been reserved by generous donors. Commemorative items are available for gifts of $150,000 or more; gifts of $100,000 or more are recognized as Christ Cathedral Guild members.